I don't wade into wars in the blogosphere very often; I find them stupid and unedifying. But the little rift over One Peter Five's recent article "The Incredible Shrinking Bishop Barron" by Maureen Mullarkey caught my attention. Mullarkey found fault with Barron's lackluster approach towards Islamic terror. This prompted an indignant response from blogger Brandon Vogt, who called Mullarkey's post "exaggerated polemics" and "misleading", devolving into "baseless speculation." If you wonder why Vogt got so huffy over Mullarkey's post, I would imagine it is because he is "Content Director for Bishop Robert Barron's Word on Fire Catholic Ministries", so he has a vested interest in defending Barron. This is unfortunate because, as we will see, Robert Barron adheres to a Modernist view of Jesus Christ's identity. 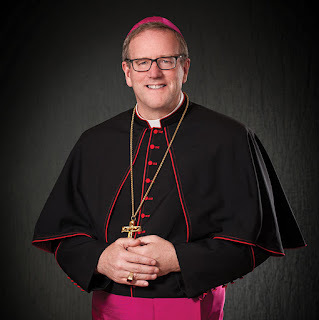 There are many things Bishop Robert Barron can be criticized for. I have raised concerns before about his promotion of Hans Urs Von Balthasar's theory that hell might be empty. But I honestly had no idea until recently what a thorough-going Balthasarian Bishop Barron actually is. He not only promotes the empty hell thesis, but has also adopted Von Balthasar's extremely unorthodox Christology. For years we have attempted to demonstrate that Hans Urs Von Balthasar is not an orthodox theologian, not only due to his controversial theory of a potentially empty hell, but just in terms of his basic Christology. Catholics need to understand that it is not just one theory that makes Balthasar questionable, but a whole slew of bizarre novelties. We recommend reviewing our previous articles "Balthasar's Denial of the Beatific Vision in Christ" and "Balthasar and the 'Faith' of Christ" on the Unam Sanctam Catholicam website, which both deal with Balthsar's unorthodox Christology, as well as "The Heresies of Balthasar" on this blog, which reveals Balthasar's absurd position that sin has its own ontological reality. One staple of Balthasarian Christology is his teaching that Christ only gradually came to understand His messianic identity, and that this did not happen by any infused knowledge by virtue of the Incarnation (Balthasar strongly rejected the idea that Christ had any knowledge given directly from God about His mission). Instead, Christ had to "learn" that He was the Messiah, basically through regular human intuition. It kind of slowly dawned on his consciousness as He grew. "It is almost universally admitted that God infused into Christ's human intellect a knowledge similar in kind to that of the angels. This is knowledge which is not acquired gradually by experience, but is poured into the soul in one flood. This doctrine rests on theological grounds: the Man-God must have possessed all perfections except such as would be incompatible with His beatific vision, as faith or hope; or with His sinlessness, as penance; or again, with His office of Redeemer, which would be incompatible with the consummation of His glory" (ibid). Jesus has "just learned his deepest identity and mission" at His baptism, implying that He was in positive ignorance of his identity and mission before this moment? “She is this the symbolic embodiment of faithful and patient Israel, longing for deliverance. In John’s Gospel, she is, above all, mother – the physical mother of Jesus and, through him, the mother of all who would come to new life in him. As mother of the Lord, she is, once again, Israel, the entire series of events and system of ideas form which Jesus emerged and in terms of which he alone becomes intelligible. Hans Urs von Balthasar comments in the same vein that Mary effectively awakened the messianic consciousness of Jesus through her recounting of the story of Israel to her son. So in the Cana narrative, Mary will speak the pain and the hope of the chosen people, scattered and longing for union” (Robert Barrion, The Priority of Christ, p. 73). Notice, he links up his own idea that through Mary Christ “becomes intelligible” with the Balthasarian heresy of Christ not knowing who He was until sometime later. Christ learns who He is by listening to stories about Israel! Barron does not dispute Balthasar - rather, he uses him to bolster his point. “Like the ‘Jesus as symbol” approach, the ‘historical Jesus’ Christology is rooted in elements and intuitions of the classical tradition. Kung and Schillebeeckx are quite right in the insisting that Christianity must never devolve into a generic philosophy of life or symbolic system, that it must, on the contrary, maintain its clear and unambiguous connection to the very particular first-century Jew, Jesus of Nazareth, The Gospels, the Epistles of Paul, the first kerygmatic proclamations, the sermons of the earliest missionaries, the creeds and dogmatic statements of the patristic church all depend upon and circle around this Jesus. Therefore, in brushing away certain encrustations and obfuscations in the Christological tradition and focusing our attention on the irreplaceable character of Jesus, Kung and Schillebeeckx and their historical-critical colleagues have done the church a great service. Furthermore, in insisting that the high dogmatic claims of Christology should be consistently informed by a biblical sensibility, the historical critics have compelled Christology to abandon mere flights of speculation and to remain, thereby, truer to its proper origins and ground. The ‘Jesus of history’ can indeed function as a sort of check on unwarranted theological exploration” (p. 42). "Kung and Schillebeeckx and their historical-critical colleagues have done the church a great service." This phrase should send up red flags (Kung was stripped of his license to teach Catholic theology because of his heterodoxy and has also been praised by Freemasons for "lifetime service to the Craft"); also alarming is Barron's promotion of "the 'Jesus of history' as a "sort of check" on certain aspects of Christology. But, what are these “encrustations and obfuscations” in the Christological tradition? Where is there a problem with “high Christological claims" today or in the 20th century? What exactly are these claims? He does not say, but if he is following the school of Balthasar, then he is probably referring to the Christological teachings of the 5th century during the Nestorian and Monophysite heresies, developments in theology which Balthasar (and by implication, Barron) implicitly reject. “John Henry Newman felt that the fully grown plant is far more revealing of the nature of the organism than is its seed, and that the mouth of a river is far more interesting and deep than its source. In a similar way, the literarily, spiritually, and theologically evolved portrait of Jesus is more instructive than any historical core, however carefully recovered. The Catholic instinct is not so much to assess the development by the origin as to appreciate the development as the full flowering of the origin. (pg. 43). Of course, Barron's major point here is correct; the full grown, developed organism is more revealing than the seed. Otherwise, we would fall to the error of Archaeologism-Antiquarianism. But the language Barron uses to make the point is curious; the portrait of Jesus "evolved", in distinction to some "historical core"? So the Gospels are an evolution beyond the “historical core?” What is the relation of the core to the evolved portrait? It is somewhat ambiguous, but is seems to suggest that the spiritual and theological portraits of Jesus are inconsistent with the historical core. Almost as if he is saying that “Yeah, the real history is sometimes different than what we find in the Gospels and subsequent spirituality and doctrine, but that’s okay because the evolving Church illuminates Christ. Even if X isn’t in the historical core it is still helpful for us.” If so, he is taking a middle position between the Catholic and the Modernist view of the Gospels. It could be that he is simply saying that the Church's understanding of who Christ is is radically greater than anything that could be revealed by some futile search for the "historical Jesus." That would be a more orthodox interpretation of his words - however, given his paean to Kung and the historical-critical method and his rejection of tradition Christology as full of "obfuscations" and "encrustations", we are not remiss or hasty in positing the former interpretation as possible. “The author of John’s Gospel stresses this dimension when he puts in the mouth of Caiaphas the words ‘You do not understand it is better for you to have one man die for the people than to have the whole nation destroyed’” (p. 105). The author of John? Puts into his mouth? If this is any indication, Barron appears to buy into some of the errors of the historical critical method (e.g., that the Gospel of John was not written by John) while not going as far as say, Kung – that is to say, he is definitely a Balthasarian. So, these words that "the author of John's Gospel" had "put" in the mouth of Caiaphas are an example of a "literarily" evolution, since he claims it didn't happen historically. If we use that as a reference, then it appears he is claiming that there are indeed theological evolutions, not contained or even implied in the "historical core." What would these be? Given Barron's earlier statements about Christ having His "messianic consciousness awakened" and having "learned his deepest identity and mission" only at His baptism, we can only conclude that the Catholic doctrine of Christ knowing his Messianic duty is one of these "encrustations" not found in the "historical core." It is, seemingly, a denial of a doctrine and at the same time and affirmation of some level of the Modernist's principle of the evolution of doctrine. There is certainly something bizarre going on here and that it he denies Christ's knowledge, which affects the doctrine of His Beatific Vision. Bishop Barron's book appears to oscillate form orthodoxy to heterodoxy to error, back and forth; it makes one’s head hurt. There is much more in this book, much more, that is either erroneous or just bizarre. Barron's words, like those of his master Balthasar, are easily manipulated, and a demonstration that the New Theology is inept at communicating theology, always intentionally or unintentionally laying traps so that orthodoxy is restrained and error and heresy goes free. Bishop Barron is not a bastion of orthodoxy. Like Balthasar, he says some things that sound good when compared to progressive liberalism. But taken on their own merits, Barron's teaching is very troubling. One Peter Five - and all Catholics who love our heritage - are right to be suspicious of him. And those who defend Bishop Barron (like Vogt) need to address these glaring errors in Barron's work. Special thanks to reader Alexander for drawing my attention to these abnornmalities in Barron's work. Follow this blog and website on Facebook! Jesus could learn things, in a human way, what he already knew through His Divinity. It is ultimately a mystery. Please post that to the Facebook thread. I assume Bishop Barron believes that macro evolution is true or maybe he believed God is not the author of scripture or both. If an individual believes that God is the author of scriptures how could he adopt Hans Urs Von Balthasar reasoning unless he believes God is a liar. Also, I believe a Christian is more likely adopt such a view if he believes macro evolution has occurred. In "Providentissimus Deus," Pope Leo XIII stated that God is the author of the Holy Scriptures. To imply that scripture is not true is to call God a liar or if we limit our scope to human agents, a person making such claims is implying that the writers of scripture were liars or gullible. As to the macro evolution, the Kolbe Center for Creation Research (website http://kolbecenter.org/) is is defending the traditional Catholic teaching that macro evolution did not occur. The Blessed Cardinal Newman's ideas about how christian ideas evolved are one thing. The ideas about the evolution of christian ideas in the area of modern, liberal, historical-critical approaches to biblical literature are something entirely different. Newman was concerned with showing how the church of the first century grew into the catholic church of his day. Liberal biblical criticism is concerned with how the historical actions and words of Jesus evolved into the New Testament documents. The purpose of one is to see how the Holy Spirit caused a single living organism to grow through history. The other is a vain attempt to create a gulf between Jesus as a historical figure and Jesus as He is worshiped and understood in the scriptures and in the church. To talk about those two completely different senses of the development of christian ideas is to invite confusion. The short answer to both is that the Christ of faith is the Christ of history, and that the catholic church is the church in the New Testament. I am very sad about the way my view of Bishop Barron changed today. How the mighty have fallen! I hope that I am merely a dense and suspicious quibbler. If I am not, then we need to pray for our Bishops to think about and declare the gospel more clearly. I too have come to the same conclusions about Bishop Barron. How sad the church is full of such as him. I too have come to the same conclusions about Bishop Barron. It is sad that the church is full of such heretical leaders. St. Bonaventure makes it very clear the only knowledge that it could be said Christ lacked in His Sacred humanity was experiential knowledge. Meaning from the moment of His Incarnation as man He knew all things in His Humanity but He did not experience them as man in the womb of the Immaculate. He knew His birth, exile to Egypt, return to Nazareth, public ministry, Crucifixion, Death, and Resurrection He knew the time, place and circumstances of each as well as the hair on every head! Bishop Barron is a Modernist pray he repents or is stopped.